we wanted to have more definitive visual presence for our existing site and social media presence. Our original logo was designed by Abram Siemsen in 2011. Abram is a talented graphic artist who currently works as an Interactive Strategist in St. Louis, MO. 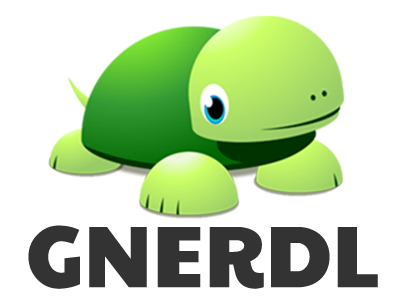 Our re-designed logo has a more active turtle. The new font choice and brighter color scheme add vibrance to the brand. Copyright 2014 GNERDL, LLC. Powered by Blogger.